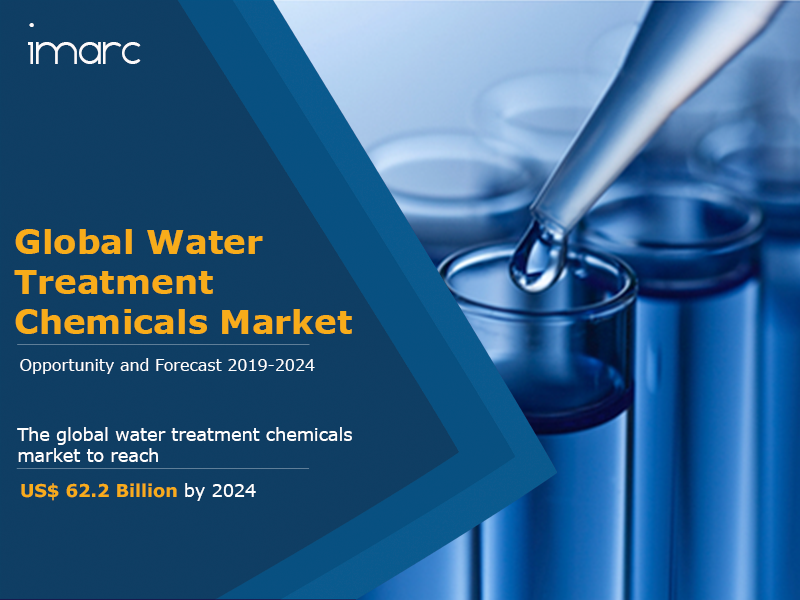 The global water treatment chemicals market was worth US$ 44.6 Billion in 2018. Water treatment refers to the process which is carried out for eliminating impurities from water and making it fit for industrial and domestic use. It is primarily divided into four basic processes, boiler water treatment, water purification, cooling water treatment and wastewater effluent treatment. These processes assist in eliminating suspended solids, fungi, viruses, algae, bacteria and minerals present in the water. Some of the chemicals used in the water treatment process include algicides, muriatic acid, chlorine, chlorine dioxide and soda ash. As the existing water supply is insufficient to fulfil the rising demand for safe and fresh water, water treatment chemicals are increasingly being used for purifying ground, sea, and industrial wastewater. With growing population and rapid industrialization across both developed and emerging markets, the demand for fresh and useable water has been proliferating. Moreover, the increasing requirement of clean water in power plants, oil and gas, metal and mining, pulp and paper, and chemical processing industries has increased the demand for water treatment chemicals. The limited availability of potable water has also given rise to the recycling of wastewater which is anticipated to contribute to the growth of the market. Apart from this, environmental concerns, stringent government regulations, increasing investment in the industrial sector, growing adoption of chemically treated water, and rising awareness among consumers about the adverse impacts of pollutants are augmenting the demand for water treatment chemicals across the globe. Looking forward, the market value is projected to reach US$ 62.2 Billion by 2024, exhibiting a CAGR of 5.7% during 2019-2024. Based on the type, the market has been segmented into coagulants and flocculants; corrosion and scale inhibitors; biocides and disinfectants; Ph adjusters and softeners; defoaming agents; and others. The coagulants and flocculants segment currently accounts for the largest share. Based on the end-user, the market has been segmented into municipal, power, oil and gas, mining, chemical, food and beverage, pulp and paper and others. The competitive landscape of the market has also been examined with some of the key players being BASF SE, Ecolab Inc., Kemira OYJ, Solenis LLC, Akzo Nobel N.V., Baker Hughes Incorporated, Lonza, The DOW Chemical Company, Snf Floerger and Suez S.A.
How has the global water treatment chemicals market performed so far and how will it perform in the coming years? What are the key regional markets in the global water treatment chemicals market? What is the breakup of the global water treatment chemicals market on the basis of type? What is the breakup of the global water treatment chemicals market on the basis of end-user? What are the various stages in the value chain of the global water treatment chemicals market? What are the key driving factors and challenges in the global water treatment chemicals market? What is the structure of the global water treatment chemicals market and who are the key players? What is the degree of competition in the global water treatment chemicals market?